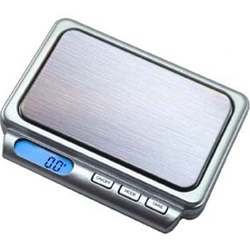 The US-Best digital pocket scale manufactured by US Balance features a blue backlight and easy 3 button controls. Ready to use out of the box. This versatile unit is perfect for measuring herbs, spices, jewlery, and the clear plastic cover serves as a weighing tray for bigger jobs. With a maximum capacity of 500 grams the "Best" can tackle weighing jobs well over one pound. - Overall Size: 4" x 3" x .65"
- Platform Size: 3.4" x 2"